Follow the journey of a North Carolina veteran who hopes to find healing through farming, but is still haunted by the wounds of a family lost and the soldier he still yearns to be. Over the past year, Farmer/Veteran has introduced film festival audiences across the country to Alex Sutton, a North Carolina-based soldier trying to forge his new identity as a farmer after three tours in Iraq. This compelling documentary has won “Best Documentary Feature” at both the Charlotte Film Festival and Brooklyn Film Festival, “Best Southern Documentary” at the Macon Film Festival, and “Best Stories of the South Award” from the Hot Springs Documentary Film Festival. This Monday, viewers can watch the story during its broadcast premiere on PBS at 10 p.m. (EST). Watch the trailer below, and read our Q&A with director Jeremy M. Lange. Why has it been important to you to share the stories of veterans? What specifically attracted you to Alex Sutton’s story? About ten years ago, I looked around and realized I did not personally know anyone who was fighting in Iraq or Afghanistan and that bothered me. I felt a responsibly to be accountable in some way for what my country was doing overseas. I am a photographer, so I figured I could use that position to seek out those affected by the wars and make photographs of them that could communicate some part of what that wartime experience was like. This was around the same time that George W. Bush had declared that the caskets of soldiers killed in action could not be photographed. I felt that this was part of an attempt to disguise the true costs of the wars from US civilians. While this was true when the caskets arrived at Dover, it was not the case if the families invited you to the funerals back home. I started contacting the families and asking permission to photographs the funerals of their children. Many said yes, some said no, and I did not go unless I was invited and when I was, I made sure to give the family prints from the service. This lead to a several year project covering various facets of the war at home. Alex and Jessica’s story is a continuation of that desire to bring attention to the effects of war on the solders and families that have fought them. I have never been the one to go overseas and photograph combat, but I felt that these stories are the other side of that coin and equally important. Veterans get far less attention and resources than the soldiers actively fighting. They come home, get some support from an over burdened VA healthcare system and are left to largely make their own way, no matter how damaged they may be. Especially those with mental trauma like Alex, who must fight again to get the resources they need to get handle on the trauma they experienced in war and reintegrate into society in some sort of new role. They are not forgotten, but I do not think most of us really understand how hard this process is and what it takes to overcome Post Traumatic Stress, even in cases less extreme that Alex’s. Alex’s story also interested me in that he was trying to use a more holistic approach, the farming, to augment his medications and occasional therapy sessions. It felt like a new narrative, and a different angle to approach a storyline that many people in the general public were exhausted by. Alex is also a huge character and the never hurts while trying to make a film. What role does North Carolina play in the film? In some ways this film could have been made in any state with a large rural population and agricultural heritage, but the landscape of North Carolina is key in the film. The seasonal shifts are a large part of the chronology of the film and those shifts are so apparent in this state. The cold clear days of winter give way to that shift in light as the humidity grows through spring giving way to the drone of the insects of summer. I am sure there are other places where some thing like this occurs, but to me it is special and unique here and I think this environment gave Alex the space and courage to make a try at the new life he and Jessie carved out for themselves. He could be so far away from his past at Ft. Bragg, but if he need to reconnect to that heritage, it was just an hour or two down the road. This is a state where you can isolate yourself completely and be left alone, but when the spark of sociability grabs you, it is not so far to civilization. I think that really suited Alex and he felt comfortable starting a new life here. I’ve read that your original vision for this film transformed as you got to know Alex better. Could you speak a little bit about that evolution and why you chose to pivot? We had originally intend to make a lighthearted short film about the growing movement to get recent veterans into farming. Seemed straight forward enough; strong, able-bodied people come home from war and need new jobs and purpose. The country needs farmers — many are approaching retirement without family to take over the farm. We started with that idea in mind, but quickly realized that Alex’s story was far more complex and his struggles far more nuanced. I think with any documentary project or piece of journalism you have an initial impression of the story going in, but your responsibility is to follow the story where it goes and put your preconceived notions away and just watch, listen, and present what is there as best you can. That is what we tried to do here with Alex and Jessie, let them tell their own story, their own truths, and form that information in a way that audiences can follow and appreciate, but also speaks to the larger issues of mental trauma, reintegration, and the hardships of caregivers. 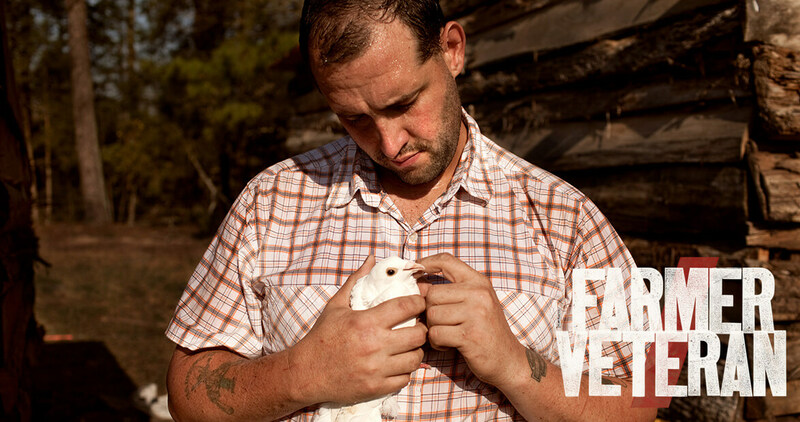 What do you hope viewers (in North Carolina and beyond) take away from watching Farmer/Veteran? We hope that viewers from around the country can just get a better idea about how hard it is to do what Alex and Jessie, and tens of thousands of other folks around the country, are doing. Finding new purpose, a new mission in life, while trying to raise a family and be good to each other. I hope that the strength of Jessie is a talking point with folks, because without her there is no Alex. He is strong and a fighter, but Jessica is the glue for the whole thing. She is there for Alex, there for the kids, there for the farm. It is beyond exhausting but she handles it in a way I can only watch, admire, and aspire to. And there are thousands of Jessies around the country. I also hope that people realize that Alex and all those battling a similar condition, are deserving of our understanding no matter how their condition manifests itself at times. Be there, listen at least twice as much as you talk, and let people know that you care. I think if we all did more of that, the men and women battling PTSD and other war-related conditions would feel less alone and more a part of our society as a whole. Less of the other, more of the we.